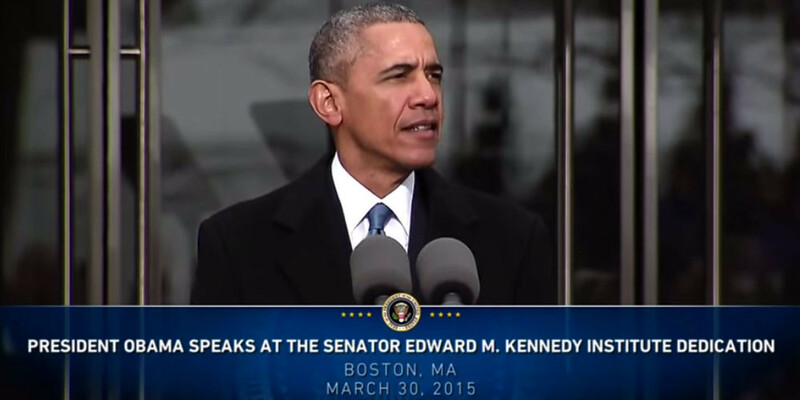 President Obama, Vice-President Biden, Senator McCain and host of other Senators, Governors and politicians were on hand for the dedication of the Edward M. Kennedy Institute on March 30 in Boston. So were we. All of the speakers, from Vice-President Biden, to Senator Lott to Senator Warren gave inspiring speeches, touching on Senator Kennedy’s legacy, the role of the Senate and vision of the EMK Institute. But none were quite as inspiring to me, as hearing President Obama talk about the Senate Immersion Module (SIM) we designed and the potential impact it might have on kids and maybe even adults. President Obama spoke of the SIM in much the same way we did when were designing it: this is a chance to play to our better angels, to recognize the transformative power of participating and having your voice heard. As we designed the SIM we often had people tell us we should represent lobbying and the more unseemly side of politics. We shied away from that. Not out of naivety, but because we felt the SIM was a chance to speak to our better angels and represent the framers intent. We wanted people to feel empowered, to feel they could make a difference through their voice and actions and compromises. The SIM offers an embodied learning experience, giving it a lot of potential to touch people. So why not do that with as much positivity as possible. It was incredibly gratifying to hear the President think the same way. It’s not often you get to hear politicians speak so highly of the potential for games to transform players in a positive way. So getting to hear those words spoken about a game we designed was truly thrilling.